If you’re a big fan of Kate and William, then the next time you’re in London, check out the Royal Wedding walking tour that will take you to places where they ate, danced, broke up and attended other royal get-togethers. The £15 walking tour is given by Celebrity Planet, which also offers a Princess Diana memorial tour, a Harry Potter tour, Notting Hill/Portobello Road tours, a Jack the Ripper walk and a Beatles London tour, among others. Don’t want to pay for a tour out of your student traveller budget? Then make your own map. Many of the Royal Wedding locations are listed on the Celebrity Planet website, and there are many sites that list Harry Potter locations in London. Grab a map and a highlighter and you can plot your own day around London, at your pace. You’ll miss out on the color commentary though, which can be part of the fun if you have a good guide. Know of any other good walks in London? My trip to the Wizarding World of Harry Potter in Orlando is still four months away (I’m going for Halloween), but I. Can’t. Wait. Check out some videos of the official opening. I’m such a geek, you guys. I’ve been looking forward to this new Harry Potter theme park in Orlando for more than a year now – at least since I started reading all the online chatter about it. With opening day near I couldn’t wait to plan my trip. I’ve never been to Orlando before because there are always too many other, more exciting places to go, but no way can I pass up a chance to tour Hogsmeade, shop at Honeydukes and hopefully spot a few Weasleys. Normally I’m very wary of package deals, especially when going somewhere as touristy as Orlando. Sometimes you’ll think you’re getting a good deal until you do a little research and find that booking everything separately on your own is much cheaper. The packages being offered by Universal Orlando (where Harry Potter lives – he’s not at DisneyWorld) are pretty good though. If you want to stay at one of the three hotels and resorts on the Universal property, you’re going to pay a lot. But if you’re willing to stay at a nearby hotel, maybe a mile or two away – with free shuttle service – you can get four nights hotel and a three day pass for the Universal parks for less than US$350 a person. That’s based on two people going. If you can get a group of four, then it works out to about US$280 a person. Grab a great student airfare and you can totally swing this trip with the earnings from your summer job. My friend and I decided we didn’t want to fight the summer crowds, and we were willing to wait until the fall when schools get back in so that there wouldn’t be so many little kids getting in our way. As long as we were waiting that long, we brilliantly realized that there would be no better time to travel to Harry Potter land than Halloween, and we chose that morning for our free breakfast at the Three Broomsticks. Hopefully they’ll be serving up some special holiday treats. Comic-Con 2009: I Love Weasleys! I saw a lot of wonderful things, but he was one of my favorites. I love Harry Potter, but I *super* love Ron/Rupert. I love the twins too, but you don’t see many of them. I actually passed this guy in the exhibition hall early in the day, but by the time I fought through the crowd to get a picture, he was gone. I kept my eyes open though and when I saw him later in the day I said, “I’ve been looking all over for you!” I hope I didn’t scare him. With the release of Harry Potter and the Half-Blood Prince this week, you might be yearning to add a little more magic to your next trip. I would love to go stay at the Burrow myself, but since that’s not possible (yet – I would love to see someone open a Weasley hostel) let’s explore some other ways to get your Harry Potter travel fix. Visit London’s Kings Cross Station and get a picture of Platform 9 3/4. Yes, there’s a sign there for you. Also stop by Platform 4, where the filming was actually done. The London Zoo is where we first see Harry talking to snakes. Please don’t try to let any of them out. Walk through Leadenhall Market in London, which stood in for Diagon Alley. Ollivander won’t be there, but maybe you can buy a cloak. Rick Steves has a list of other filming locations throughout England and Scotland. Finally, the Harry Potter Theme Park in Florida is scheduled to open next year, so you can start thinking about a trip to Orlando. 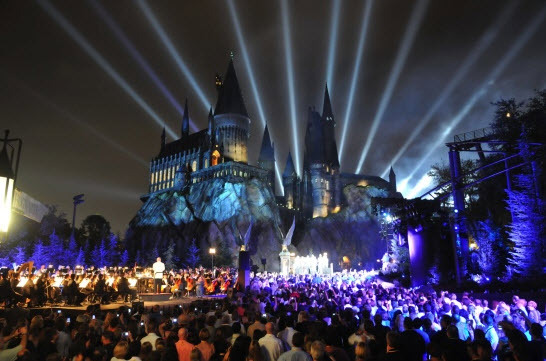 Maybe you’re already planning to be one of the first in line when the Wizarding World of Harry Potter opens its doors at the Universal Orlando Resort in 2009. But if you’re really serious about your theme parks, consider delaying your trip by a few months and doing an around the world trip to take in a few more. Universal has just announced another new park, this one a bigger and fancier version of the Hollywood-themed Universal Studios, to open in 2010. Location? South Korea, about 20 miles south of Seoul. From there it will be just a hop and a skip to Tokyo Disneyland, and then you may as well head south to Australia’s Gold Coast to do the full theme park tour. They have Sea World, Wet ‘n’ Wild Water World, Movie World, and Dreamworld. Still haven’t had enough? Take another long flight to reach Ratanga Junction in Capetown, South Africa. Then swing up north again for a stop in Paris and (no, not Disneyland Paris), Parc Asterix, based on the popular French cartoon character. Alright, so that might be a lot for one trip, especially if you don’t have $10K or so to drop all at once, but for a tired backpacker, or a traveler who’s feeling a little museum-ed out, a day of rollercoasters, costumes, and parades can be a nice treat. Always check for student discounts as well, so that you’ll have a little extra to spend on postcards.